Here in Atlanta, we have a lot of trees. 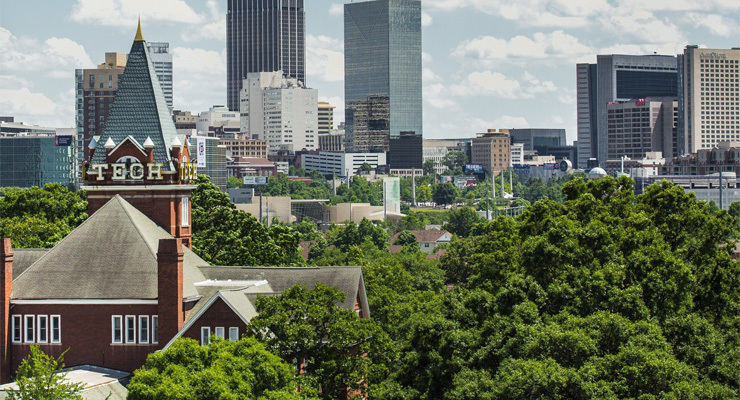 In fact, the National Forest Service named Atlanta’s metropolitan area as one of the most heavily forested urban areas in the nation. Trees of all shapes and sizes can be found around Atlanta including varieties of elm like the winged elm, American elm and lacebark elm, pond Cyprus, American snowbell, sassafras, more than a dozen species of oak and blackgum and crabapple trees as well. When these trees get in the way it is time to call for tree removal. Most people get the urge to trim or remove trees during our warmer months, starting about the middle of May when temperatures are averaging 70-80 degrees and all the way up until October when they start to drop past that. But you can get trees removed anytime you need to for the most part. This guide will help you understand what sort of services are included with tree removal and help you decide the best way to proceed. What is Included in Standard Tree Removal? Standard tree removal usually includes the chopping down of the tree, including climbing or bringing larger branches down by rope so that they can be cut and chopped into a manageable size. Some tree removal services include the hauling with their standard service, and some charge extra, but either way it is almost always included in your quote. There are other services besides the removal itself that usually costs extra. One of those might be the hauling away of the tree as previously discussed but here are some others. 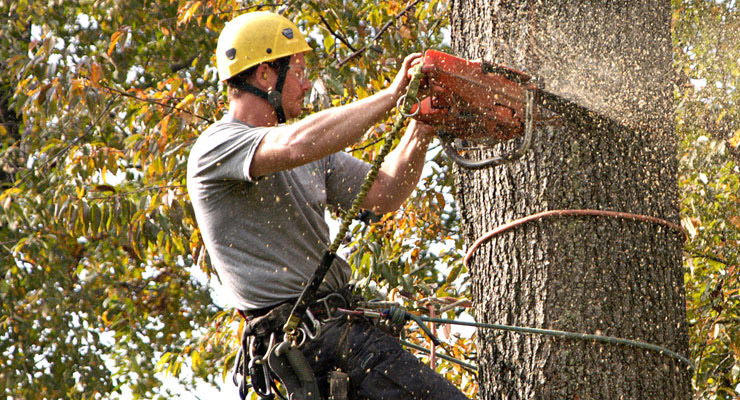 A standard Atlanta tree removal cost will depend upon the size of the tree. However, you can usually count on a minimum of $300, even for very small trees. Here is a guide to prices by size just so you have a general idea. Note: For massive trees like 75’ and up, you are almost certainly going to have to pay extra for removal and it is going to be at least $1000. Can the Average Person Remove a Tree Themselves? In the olden days, this was a common practice. Settlers would use teams or horses or mules to pull large stumps from the ground when they need to remove a tree, and it was always chopped up into firewood. However, these days it is not only complicated and dangerous, it also requires special equipment that the average homeowner doesn’t have access to. If you’re tempted to try to remove a tree yourself, just remember that your hospital bills will likely be a lot more than the cost of the removal would have been. What about Trees That Have Already Fallen? In some cases, if a tree has already fallen, you might be able to take a chainsaw and chop it up yourself and haul it off. If it is a big tree however, you should leave it to the professionals. Here’s a good rule of thumb: if you can’t haul it away in the back of a pickup truck in two loads or less, call a professional. You should keep in mind that the type of tree it is can affect the price. For example, oak is one of the toughest trees out there and there could be a surcharge or a higher quote for removing one. On the other hand, a small pine tree is a much easier job and could be priced lower. Many tree removal services also do trimming. Ask about a discount if you get both together. Trees are a wonderful feature on a piece of property. They add privacy, they create shade and they provide colorful foliage. However, despite how wonderful trees can be, there are times when they can be detrimental. For example, a dying tree can be a huge safety hazard, or a tree that has a root system growing into your septic tank can be extremely problematic. Whatever the reason is, if you have a tree on your property that you need to have removed, it is highly recommended that you have a professional do the job for you; especially if it’s a large tree. Tree removal can be a dangerous job and it involves experience and know-how in order to not only remove it safely, but to remove it properly. There are a lot of tree cutting services out there; but, how do you know which service is the right one to go with? Before you pick the first company you find, here is some food-for-thought that you should first take into consideration. Obviously, the more experience that a tree removal company has, the more likely it is that they will know how to do the job the right way. Experience is always a good thing to have, especially when it comes to tree removal. However, that doesn’t necessarily mean that a new company that doesn’t have much experience is a bad choice. Find out how qualified they are to do the removal. Ask what type of tools the company uses and what technique they will utilize to remove the tree. These are factors that will definitely influence the type of job they will do. Reviews can tell you a lot about a company. Check the Web for reviews of the tree removal service you are considering working with. Past customers are always eager to share their experience. If there are a lot of negative or indifferent reviews, that should be a red flag for trouble. Insurance is an important factor to take into consideration when hiring a tree removal company. If there is any damage done to your property or someone is injured, who will cover the costs associated with damage and injury? If the company doesn’t have insurance, you could be responsible for paying. Insurance is an absolute must. Another factor that will weigh strongly when choosing which tree removal service to work with is the services they offer. For example, once the tree is removed, will the company remove or grind the stump? Will they clear the land? Will they remove the branches and the logs? These are all important factors to consider when selecting a tree removal service. Having a tree removed is a big job. You want to make sure that you choose a company that is reputable to do the job for you. With this information in mind, you will be able to choose the right company for your specific needs. Trees are a wonderful part of a landscape. They add beauty, they add privacy and they provide shade. However, while trees definitely offer a number of benefits, when they are dead, they can cause a host of problems. Whether a tree on your property is dying because it has been struck by lightning or it has died as a result of age, having the tree removed is extremely important. Why? Here’s a look at five very good reasons. A dead tree is extremely attractive to pests. Termites, carpenter ants and other wood boring insects will seek out the tree and set up shop in it. These bugs will quickly multiply, which means that other trees or even your house could be in danger of being infested. Additionally, animals may seek out the tree and nest in it. Rats are known to create nests in dead trees, and when a rats are in your dead tree, they’ll eventually invade your home to find food and additional shelter. A dead tree isn’t strong, which means that there is more of a possibility that it will fall over. There’s no telling when a dead tree will topple over, but it’s a pretty safe bet that it will fall at some point. 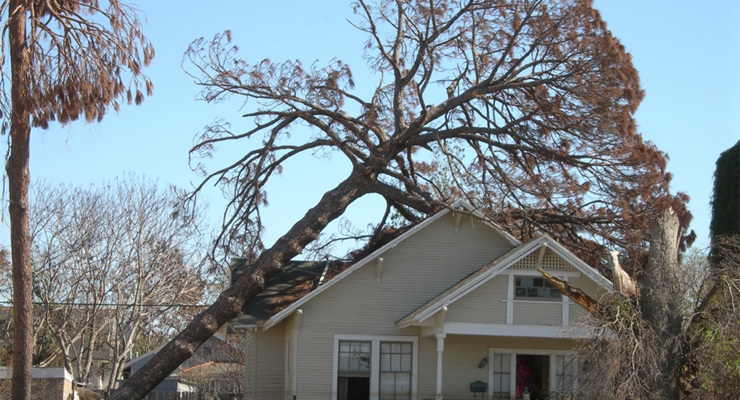 When it does fall, it could land on your house, your neighbor’s house, your fence or on any other piece of property resulting in a costly emergency tree service. There’s also a possibility that it could fall on someone, causing serious injury. In the event that that dead tree does fall and do damage, you are liable for the repairs or the medical care that may be needed as a result. When a tree is dead, its structural integrity is compromised. A gust of wind could blow and as a result, those dead branches could fall off. When a branch does fall, it could land on top of a car, a fence, a roof or even a person or an animal. The damage or injury that may result could be catastrophic. Having a tree removed before it falls could save you a ton of money. If a disease killed the tree, the rest of the trees in your yard could be impacted. Tree disease is contagious. For instance, if mildew or mold develops on the tree, it could spread to the other trees and plants in your yard. As a result, your entire landscape could be destroyed by that one single dead tree in your yard. Dead trees just aren’t attractive. You want your yard to look as visually appealing as possible. When you have a tree that doesn’t have leaves, has branches falling off of it and bark is peeling off, the aesthetic appeal of your yard is automatically impacted. When the curb appeal of your home is impacted, your property could lose value, which could hit you in your pocket if you’re thinking about selling. Given these five reasons, having that dead tree removed from your property is an absolute must. One of the first things to consider is that most holly trees are deciduous, so you will need a male and a female plant for fertilization. 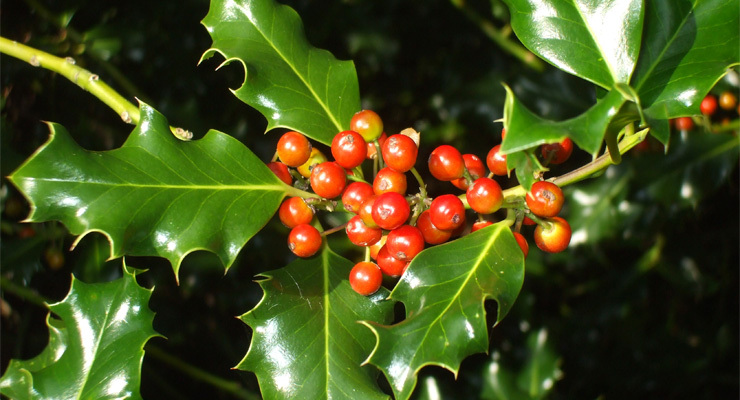 Some types of holly are self-pollinating, but most of them require both to fertilize. Firstly, you will want to dig a hole (where it is to be planted) about as deep as the plant container in which it comes in. The width should be around twice that of the container and can sometimes be larger. If you run into a roots of an old tree, you should consider stump removal. In the winter, apply some slow release fertilizer but be careful not to overdo it (hollies react bad to overfeeding). In late winter, the tree needs pruning after the berries are ripe.